The Joys Of Reading….At Any Age! Anyone who knows me or has ever read my blog knows that I love to read. The only thing I like more than reading is discussing what I read. I come by this honestly, as both my parents, now in their 80’s are avid readers. Ever since my parents moved into a retirement community I have been trying to get them to start a book club and even went as far as to volunteer to help them get started. I guess I should not have been surprised when I received a call from Betty the activities coordinator. Together we picked a date for our first official meeting, a gathering to find out just how many people were interested in a book club as well as what they would like to read. Together, Betty, Dana (another member of The Friday Morning Bookclub whose parents live in the same retirement community) and I set up the circle of chairs. Would we get a dozen people? We knew there would be at least four as our own parents wouldn’t dare miss it.Were we ever surprised (and relieved) and when 25 plus enthusiastic seniors showed up! The meeting was wonderful and we chose our first book, Defending Jacob. Now the big question…how many of those 25 some people would actually read the book and come to the next meeting? Betty, Dana, Bonnie (another member of the Friday Morrning Bookclub) and I sat anxiously waiting to see. Slowly people began to arrive. They just kept coming and our circle kept getting bigger and bigger as more chairs were brought into the room. 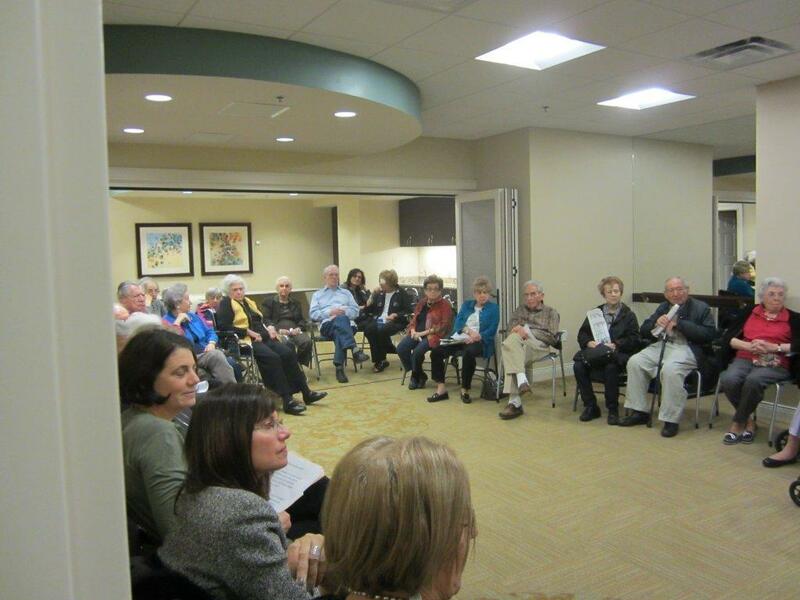 FORTY FIVE seniors showed up to discuss Defending Jacob. We had educators, entrepeneurs, social workers, attorneys and even a police officer. Most of all they were parents, aunts, uncles and grandparents and they brought with them a lifetime of experiences. They were enthusiastic and they came ready to discuss this gripping thriller of a book. This was truly one of the best book club meetings I have ever attended. Everyone participated, there was no chatter and best of all were the smiles on everyone’s faces as they left! Next month: Once We Were Brothers……….. I can hardly wait! Very cool, Susan! I share your excitement and applaud your leadership. Only wish I had seen your parents (my aunt and uncle) in the photo! Thank you Marilyn. If you look in the back left corner with a magnifying glass you can actually see my father! What a wonderful idea! Susan, I’m not surprise that you would organize and volunteer your time to start a new book club. It’s so nice to hear that these seniors are active, opinionated, and still social!! I hope that our book club will still be meeting when we’re in our 80’s and older! Next, you have to come up with a name- how about Senior Moments Book Club. I love it! The Senior Moments Bookclub. I guess I should run it by the group! Any other ideas out there? Wow! Congratulations! This sounds fantastic. up to look forward to. You are a generous and kind person. M J : Susan that made me cry! What a gift you are! I wanted to read Once we were Brothers and now I will! You are all very sweet, but the truth of the matter is I absolutely loved doing it! I look forward to the next meeting of “The Senior Moments Bookclub”. What a great name…thanks Audrey! I have to say I enjoyed the residents articulate and knowledgeable comments on the book and they were so Thankful that you started the Bookclub ! I thought I was helping but they made me feel grateful to be with them. I would be glad to help again. Thank you Bonnie! I really appreciated your support..Every time I visit my parents someone comes up to me and tells me how much they enjoyed the meeting. and are looking forward to the next one. What a good feeling!. How exciting to know that in my “old” age I will still be able to read and discuss books. I can’t imagine life without either. I am so glad that you took the initiative to start this group. I bet before too long you will be packed to capacity. Great job!!!! Thank you Rosanne. Our next meeting is Thursday so I will let you know! I’d enjoy an update on the books you have been discussing with your senior group, and those they liked and didn’t like. Hi Kathleen, I am definitely due for an update post and will write a detailed one after this Thursday’s meeting. (Check back in a few days!) So far The Senior Moments Book club has read Defending Jacob, Once We Were Brothers, The Lost Wife and The Art of Racing in the rain. This Thursday we are meeting to discuss The Immortal Life of Henrietta Lacks and next we are reading When She Woke (a dystopian novel). All of these books have turned out to be excellent discussion books! I am trying to give them ” a little of everything”. I really need help coming up with some good books for this co ed senior group!. Any suggestions? We are having two book discussion sessions at our church women’s group this summer – mainly older women – and now they want to continue it through the year. The first two books will be The Giver for September and Wild by Strayed for October. I’m always interested in which books work for a group. I’ll watch for your detailed post. In July we read “heaven tourist” books and for August we are reading “A Year of Biblical Womanhood” by Rachel Held Evans. The Giver is one of my daughter’s favorite books. She has read it so many times that her paper back book is falling apart and I have yet to read it. I know exactly where it is in her room and I think I will read it this weekend! It is not easy to find a good happy, feel good book. Many of the books we read are sad or disturbing ,which is often what makes them good discussion books, but I do not want to end up with a room full of depressed seniors! I am also finding it a little more difficult to find a book for both men and women. So many of the books I read are women’s literature. It is not easy to please everyone, although I have had very few complaints. Does your daughter know that it is now a quartet with The Giver as the first book? I have not read the others in the series, yet. I’ll keep my eyes and ears open for books men will enjoy too – but we are such different species that it might be hard!